Your collection of novels will shine brightly on the shelves of the Amish Double Door Small Mission Bookcase. This beautiful bookcase is Amish made, making it a durable design that contributes to your office, family room or den with ease. Mullion detail draws attention to the fine solid wood you select for this Amish made bookcase. Three adjustable wood shelves create the combination you want to accommodate your collection. The whole family will enjoy using this bookcase made with the premium quality hardwood you select. Perfect for your home furniture collection, this custom made wood bookcase is 48" high. Display a few family photos on the top shelf or place a clock or lamp on top. You choose from four solid hardwood selections. Rustic woods are also available for a natural display of your wood choice. 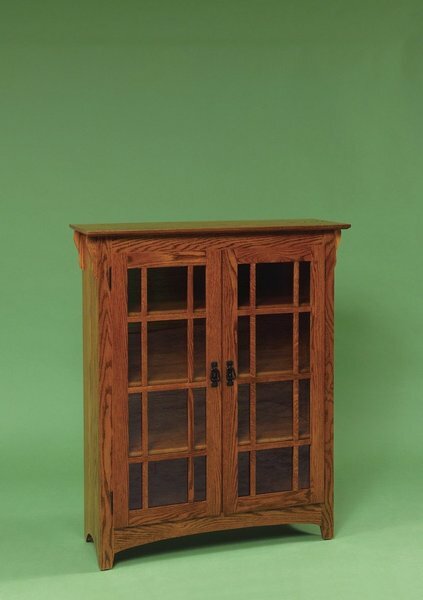 Opt to have our talented Amish woodworkers craft this mission bookcase with or without mullions-the choice is yours. A leaded glass front is available to enhance your display. Choose from a variety of quality hardware options. Browse more of our mission furniture collection for other areas of your home. Our friendly Amish Furniture Specialists are here to assist you. Email or call today with any questions or for assistance with your order. Start your fine office furniture collection today for only 30% down. Our toll-free number is 866-272-6773. We received the bookcases this morning and they are beautiful!! We received our Mission bookcases and they are wonderful. They look like they've been part of the room since its inception. Please pass my compliments to the builder. Again thank you so much and since you will get this e-mail after Christmas Day I hope you had a Merry Day.